2008: The Trees Are Back! 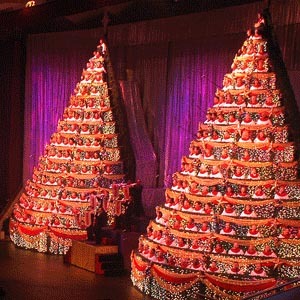 After a two-year absence, The Singing Christmas Trees are back! From its beginnings almost three decades ago, The Trees have become one of Central Florida's most loved and spectacular traditions. 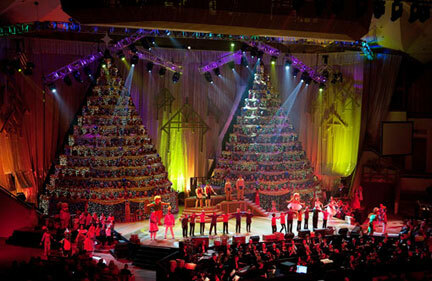 Featuring a huge choir, full orchestra, worshipful dance, powerful drama and a beautiful display of 250,000 lights. 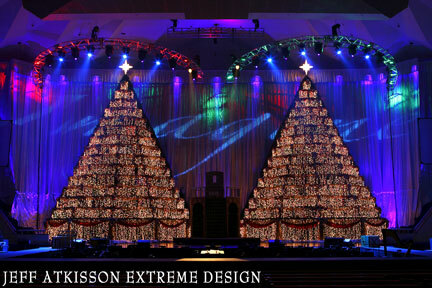 2002 was FBC Orlando's first year using the MidiLite system for their Twin 15 tier Living Christmas Trees! Initially they are "mirroring" the two trees from a 15x9x6 matrix MidiLite system using "twofers" for each block. Both trees are fully cabled and have their own permanent breakouts. This will allow for easy expansion into a dual 15x9x6 system in the future for independent control of each tree. Visit their web site for more information about First Baptist Church in Orlando.